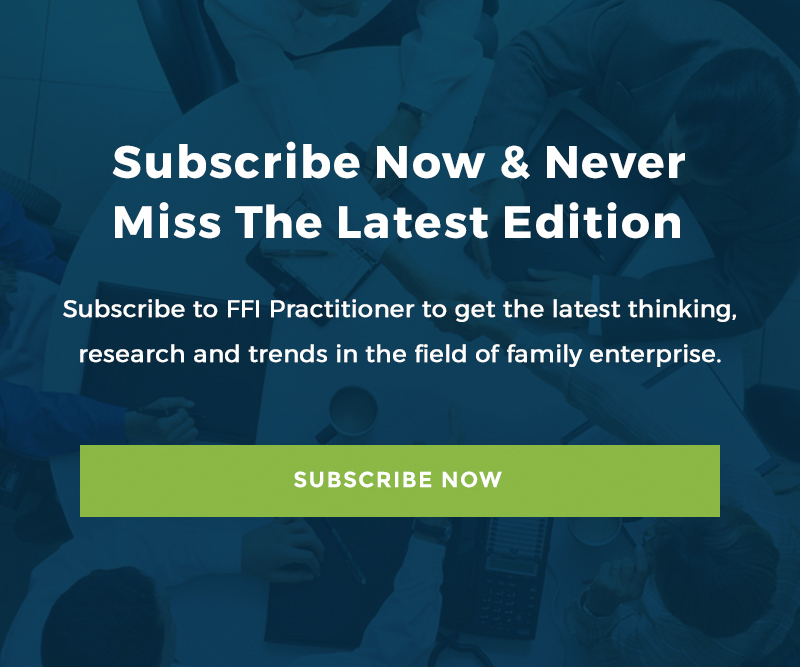 We hope that you’ve been enjoying FFI Practitioner’s month-long special issue series dedicated to the Global Conference theme – Family Business: Electrifying. As we conclude the special issue series, we would like to thank the FFI Practitioner editorial committee for their hard work and this week’s authors, Judi Cunningham and Wendy Sage-Hayward for sharing their insights on the impact that an advisor’s unconscious biases can have in their work. We are all biased. That’s a reality. For professionals in any line of work and for people in general, unfortunately, most of this bias is unconscious. The challenge, then, is to accept the presence of unconscious bias, understand its implications and effects, and take practical steps to address these through increased awareness and deliberate strategies. The ability to understand and manage biases is especially important for those serving as advisers to family enterprise—whether working on financial or estate planning, continuity, relational work and other areas. It’s easy for bias to enter into the picture because of our backgrounds and experience and because we are all familiar with issues related to family dynamics, regardless of the exact type of work we do. In this article, we offer a basic definition of bias, discuss its origins and ways of assessing it, and present the SEEDS Model® (Grant Halvorson and Rock 2015) as a framework for understanding and addressing bias more fully in the context of family enterprise advising. The goal is not to be 100% free of bias—that’s impossible in most circumstances—but rather to take a proactive approach to understanding it, recognizing its effects, and mitigating these as we work with clients. For our purposes, bias can be thought of as unconscious influences on how we see the world. These influences typically take the form of assumptions or beliefs about other people and groups. Bias is often negative in nature, with limited grounding in fact, however we can also have positive biases. Bias is rooted in both innate and external factors. As mentioned earlier, if you have a brain, you’re biased. It’s hardwired into us, likely as a survival mechanism (e.g., to make quick decisions). Biases emerge from factors such as personality, gender, family history, culture, religion, generation, as well as other things. Importantly, bias influences multiple aspects of how we think and act. It can influence our perception and attitude towards specific people or situations. It influences how we behave toward certain people and what we pay attention to. In addition, it can lead us to make micro-affirmations or aggressions towards others where we encourage or undermine people through our verbal and non-verbal behavior. A growing body of research on bias shows its harmful effects on a wide range of activities. For example, when bias leads to lower diversity in any kind of organization, it can hamper performance. A study of over 500 US companies (Herring 2009) showed that those with the highest racial diversity generated 15 times more revenue than those with the lowest. Another study, of 2400 companies worldwide, revealed that those with at least one female board member returned superior share price performance than those with no female directors (Hui 2014). Taking steps to reduce bias makes processes fairer. When orchestra auditions were made blind, women performers’ chances of making it past the first round increased by 50% (Goldin and Rouse 2000). Given the hazards of bias, researchers have developed ways of assessing bias. One of the most popular is the Harvard Implicit Association Test (IAT), which tests for bias related to age, gender, ethnicity, weight, and other dimensions. IAT results can help identify the presence of a given bias and its magnitude which is designed to increase self-awareness and build a willingness to change. Bias is especially likely in the context of family enterprise advising. Common family enterprise issues tend to elicit biased beliefs and behavior about sensitive matters such as money, family relationships (e.g., best ways to parent, how to express love and the like), and fairness (e.g., how to split ownership amongst your children). These can trigger biases among family enterprise advisers, based on their own experience and history. For example, an adviser may have a bias toward favoring males for leadership roles, based on that adviser’s own generation, experience, or family culture. It’s critical to acknowledge and address bias in family enterprise advising—and to be aware of its specific triggers for a given adviser—because it can have a clear, potentially harmful effect on the plans and thinking that come out of such advising. For example, an adviser may direct families toward solutions based on the adviser’s unconscious bias (e.g., only those working in the business should have ownership of it). Advisers may even introduce biased thinking into the family’s planning process where there was none before and exacerbate existing bias, and/or create a wide range of challenges including short-term perceptions of unfairness and long-term family rifts. Applying the framework we discuss below can help address bias in family enterprise advising and mitigate its consequences. Similarity: This type of bias is about favoring people who resemble us in some way (our ingroup), whether related to demographics, mindset, or experience—and disfavoring those who are different (outgroup). A female adviser may unconsciously favor female family members when developing an estate plan, for example, as manifest by asking for or weighing their opinions more than those of others. Expedience: This category includes several types of biases used as “mental shortcuts” to make faster, easier decisions, though they may not be best for everyone. A confirmation bias, for example, involves seeking or attending only to information that fits one’s view or preference, such as speaking only to family members who share an adviser’s opinions about ownership succession. Experience: These types of biases involve seeing one’s own perception and experience as superior, complete, or universal. For example, an attorney working with a family enterprise may believe his or her legal advice is the best on all dimensions because he or she “has seen many similar situations before.” They may not take the time to discover the family’s vision and goals; instead they assume they have the answers based on past experience and thus fail to recognize the unique needs of the family in front of them. Distance: Distance-related biases are often about favoring a solution that’s closer in time than one that’s more remote, similar to the bias of expedience noted above. The closer something is, the more we value it. An adviser may urge a family to adopt a simpler, boilerplate estate plan, for example, rather than one that will take more time to develop but may be more effective in the long term. Safety: We tend to be biased toward avoiding losses and averting threats, often at the detriment of seeking growth opportunities that may carry some risk. Negative information is viewed as more powerful and motivating than its positive counterpart. Here, advisers may use fear to motivate families—“You have to figure out succession before something catastrophic happens”—or be motivated by their own fears to advance suboptimal ideas, such as sticking with a potentially ineffective estate plan because they’ve already spent significant time on it. Working with the SEEDS framework can help identify and mitigate the effects of bias on advisors’ part, as part of a systematic approach to bias. As our understanding of bias has grown, so has the number of offerings aimed at addressing it. But proceed carefully. A simple training session on bias may not be sufficient to raise self-awareness and combat biased thinking effectively. Indeed, studies show the positive effects of typical diversity training often last as little as two days (Dobbin and Kalev 2016). Instead, take a more systematic approach that starts with understanding that everyone has at least some level of bias and become more aware of your own particular biases, which involves taking an assessment such as the IAT or other measures. Second, work to understand the many types of biases (each dimension of the SEEDS model comprises multiple subcategories) and look for them in your work with families or the work of others in your team. Identify situations more likely to promote biased thinking/behavior (such as situations with higher levels of time pressure or conflict). Third, implement strategies for reducing bias, including general ones such as collaborating with other advisers to develop a more objective view and more specific ones based on the SEEDS framework. Here are several bias-reducing strategies based on the SEEDS categories. Similarity: To combat this bias, look for common ideas and goals across individuals and in the family, rather than focusing on the factors that distinguish people, whether ascribed characteristics like gender or more fluid elements such as ways of thinking. Look to bridge disparate parties in an enterprising family based on this potential commonality. Expedience: Step back from quick decision-making to ensure a process is in place involving a solid structure and the inputs of multiple parties within the family, along with other advisers. Avoid jumping into finalizing solutions that seem to fit at first glance. Bring multiple options to the table. Slow down, and favor a thoughtful, deliberate approach. Experience: Again, collaborate as part of an interdisciplinary team of advisers to avoid bias toward your own experience. Work to include diverse viewpoints, and to open yourself to the ideas of others. Interdisciplinary teaming allows the illumination of multiple lenses through which to view the family’s issues. Distance: Work to understand the long-term outcomes families seek, and develop plans to move toward these effectively. Be careful not to push for an immediate sale or solution, but to understand what’s best in the bigger picture, and help the family and other advisers do the same. Safety: Strive to maintain perspective about your own fears regarding career and broader life, so that you’re not acting only to ward off threats but to encourage self-development and growth. Do the same for the families you advise, helping them to keep threats in perspective and develop plans and ways of thinking that promote individual and collective growth. Remember: To be biased is to be human. So rather than fighting that reality, accept it and ask yourself questions including: Am I aware of my biases and their effects on my work? Am I taking a proactive, systematic approach to managing bias? The ideas here will help you answer those questions affirmatively, for your benefit and that of the families you advise. Judi Cunningham is a visiting scholar at Kennesaw State University in Georgia. Passionate about family and business, she has dedicated her career to helping business families thrive. She co‐founded the Business Families Centre at the University of British Columbia and the Institute of Family Enterprise Advisors (IFEA), and designed and developed the Family Enterprise Advisor Program (FEA). She can be reached at [email protected]. Wendy Sage-Hayward is a senior consultant with The Family Business Consulting Group and is based in Canada. Wendy is a partner and director of a US family firm more than 130 years old, leading approximately 50 cousin partners from the third ‐ sixth generations. She is also an adjunct professor at the University of British Columbia’s Sauder School of Business. She can be reached at [email protected]. Kennesaw State University is a member of the University System of Georgia and the third-largest university in the state. The Cox Family Enterprise Center in the Coles College of Business acts as an intellectual and practical hub for the community of family members, non-family executives, external advisors, and students that it serves. The Family Business Consulting Group was co-founded in 1994 by Craig Aronoff and John Ward. It serves families and the enterprises that they have built by guiding them through the process of building structures, systems and skills for comprehensive strategy, better decision making, stronger competitive advantage, and continuity of enterprises for future generations.